If you own an Apple Watch, there are two types of accessories you definitely need. Bands are arguably the most important accessory so you can set yourself apart from the millions of other people out there who have Apple Watches. Coming in at a close second, however, is the Ottim Apple Watch Portable Charger. This brilliant little gadget lets you leave your long Apple Watch charging cable at home when it belongs. 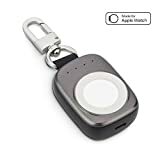 It’s only the size of a key chain, and it packs a 700 mAh battery along with an MFi certified magnetic wireless charger for the Apple Watch. Trust us, it’ll be the best $40 you ever spend. Features portable and wireless charging for Apple Watch Series 3, letting you get rid of the annoying long iWatch charging cable. Built-in rechargeable 700mAh polymer battery delivers up to 1.5 charges for your Apple Watch before it needs recharging through the micro-USB cable. Rechargeable and safe.